This book was recommended by Daymond John on page 234 of "Tools of Titans". Who Moved My Cheese - I'm a sucker for parables (stories to illustrate a moral lesson) and this book really delivers. I wish I found it years ago. It's super short but it has so many insights about dealing with change. It teaches you how to avoid over complicating things and to constantly be aware of what's going on around you so that you can adapt before things get problematic. It's one of those books where you feel sad that it's over, surprised how you managed to go your entire life without reading it and excited to move forward with whatever journey you're on. When asked what books he'd recommend to young people interested in the same career path, Darren Chua mentioned Who Moved My Cheese. Beyond communication, CFO needs to learn to influence effectively, get people to contribute so that they buy in. 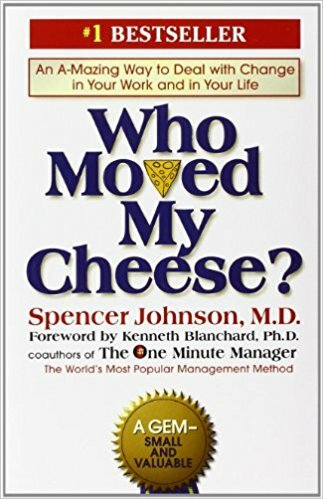 Again, this is a vast space, some of my personal favourites being Who Moved My Cheese (Johnson), Lateral Thinking (de Bono), The Art of Asking (Palmer). I believe it takes tonnes of understanding, motivation, wisdom & competence to become an extremely successful entrepreneur. To reach that high level is tough, to remain at that level is even tougher. I reckon that these books should be able to provide a basic fundamental to young peeps on what to expect before deciding to hop on to join us as a tech startup. A mash up, I know…some simple others profound but just as important, eye-opening, and affirming. These and so many more helped change how I see things, my thinking and being, and helped to understand and accept my divergent (differing/deviating) career path in life.